…which kind of sums up this season: many great sails with very little catastrophe or cursing to spice up the boat log. Sometimes I find myself pining for the days of Fuzzy Bunny, just to make things interesting, although in the long run we’re probably better off being reasonable sailors among reasonable people. 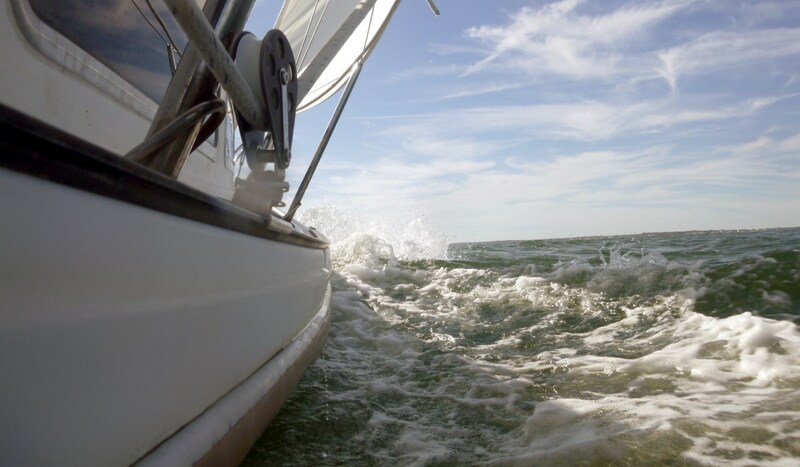 It was gusting over 20kts on the bay, which was a return to form from the previous weekend. We reefed down at the dock. There were more boats on the hard than left floating as we motored out for our last sail of the season. 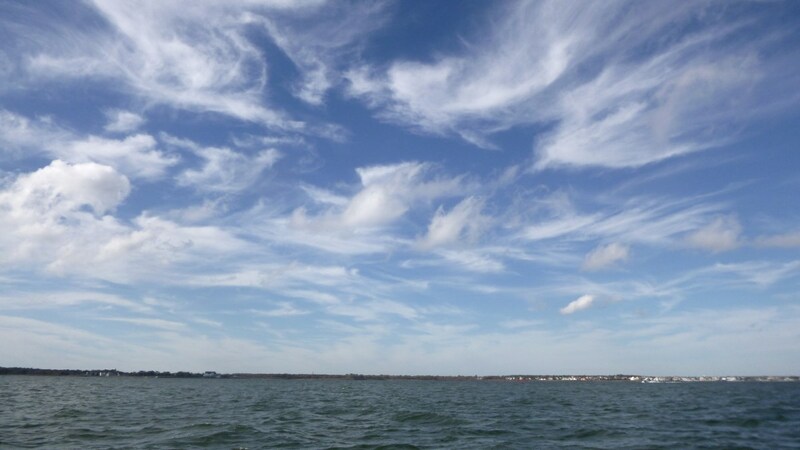 We started off sailing south, upwind under scattered, wispy clouds. 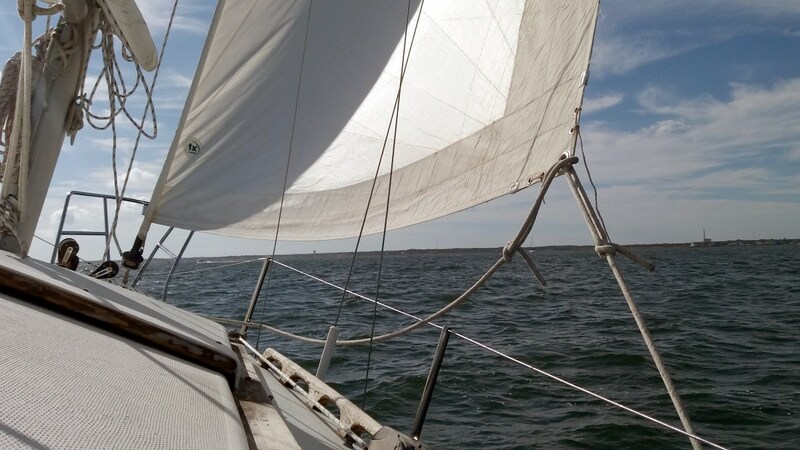 We unfurled the genoa to the foam luff and began leisurely tacking our way down the bay. 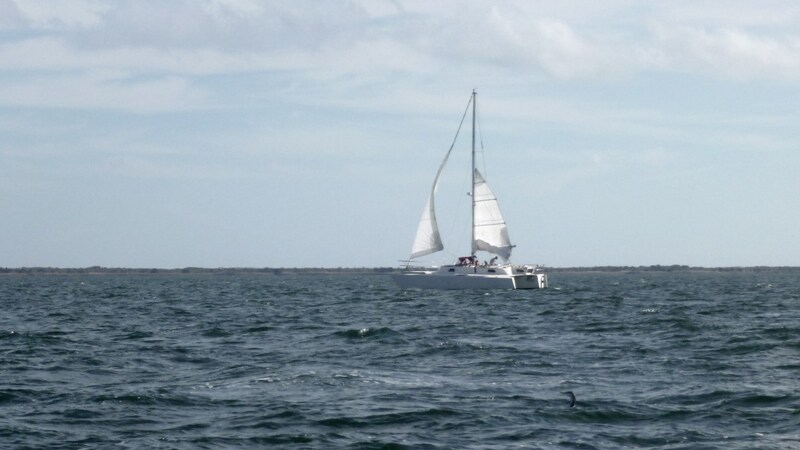 The racer in me can find casual sailing difficult, and I felt slightly bad about not flying more sail until we came across a trimaran that was so reefed that I don’t know how they were moving. I don’t pretend to understand how multihulls work, but this seemed extreme for the conditions. Or maybe they were just more casual than us. 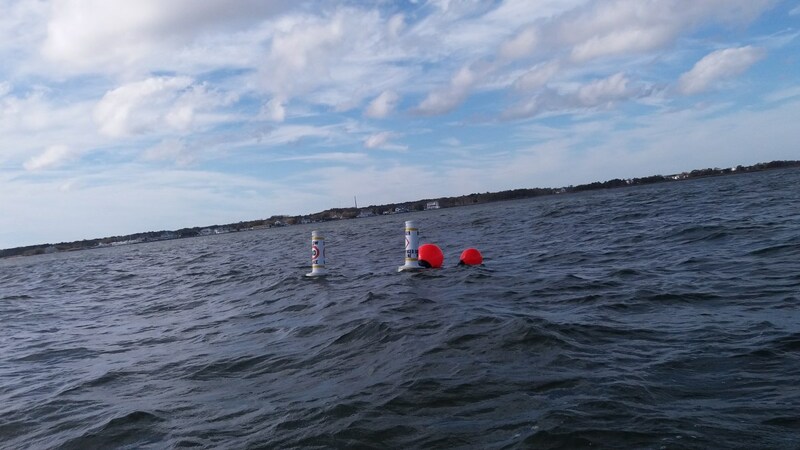 South of Forked River, we came across some buoys that hadn’t been there before. We had seen a barge in that area on our trip back from the Captain’s Inn, so maybe it had something to do with whatever work they were doing. It was definitely my first time seeing a “submerged pipeline” hazard buoy. The wind was mostly aligned with the bay, which often makes for larger waves, but there weren’t too many white caps, and fewer still along the western shore. There wasn’t enough spray to warrant putting on my foulies, and the air temperature was such that I was comfortable in my Filson Alaskan Guide Shirt. We sailed down past the inlet, where dozens of kite boarders were taking advantage of the breeze. 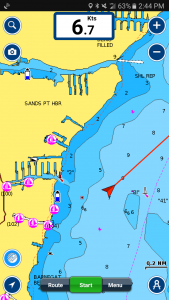 We tacked around and then went on a beam reach, just to get away form the channel and out into open water. We were even faster off the wind, and were sailing just under 7kts without much effort. 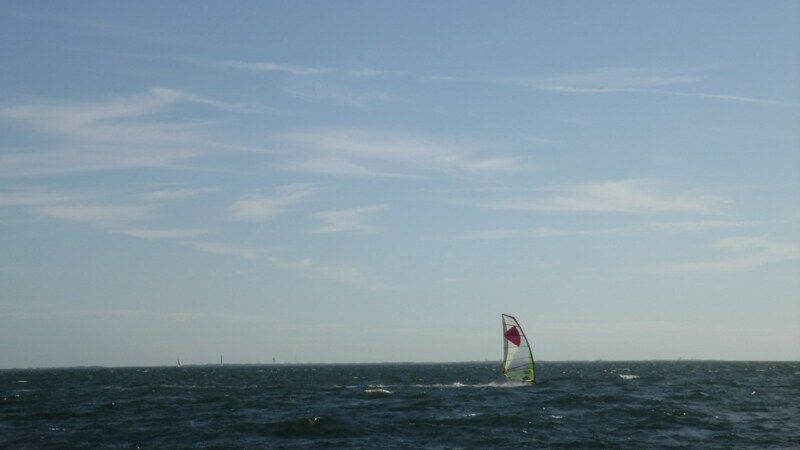 On the way back, we were buzzed by some windsurfers, sailing back and forth on long beam reaches. I tend to prefer vessels on which you can mix a proper cocktail and forego the wetsuit, but they were fast in the fresh breeze. The marina was quiet when we returned. 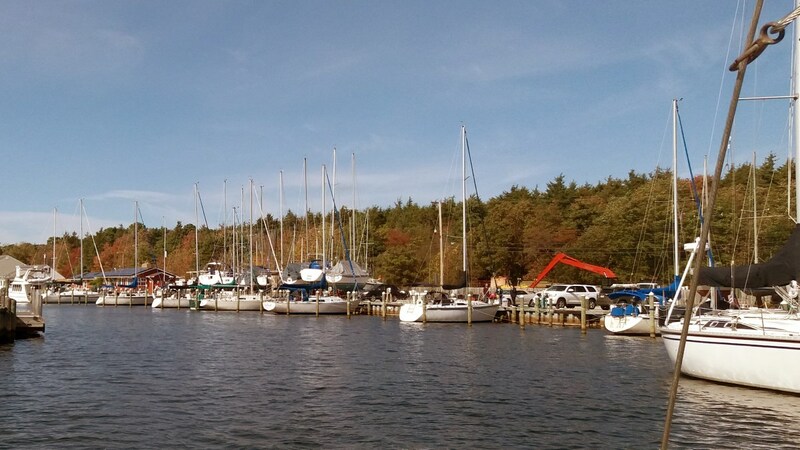 There were a few people around, dutifully winterizing their boats on the hard, but the typical buzz of high summer was gone. I wondered if the people looked up from their work and saw us motoring in, and whether they were jealous that we were still sailing or just thought that we were crazy for pushing the season so far. Either way, Jen and I were glad to get out there one more time to revel in the joy and relaxation of sailing. We’ll be up there on the hard with them by next weekend. Just found your site-it is great!